It had been a while since we'd gotten together with my college friend, Bill, and his new wife, Ann. Their wedding in Kentucky and our 30th reunion at Notre Dame had been whirlwinds of activity, so when Bill called looking for ideas on touring the coast of Maine, a Downeast rendezvous seemed in order. I had the perfect place in mindan island hideaway in Casco Bay. We'd probably have the place to ourselves; it was mid-September, and the crowds had returned to work and school. The weather is great that time of year: warm days and crisp nights. Great Diamond Island, about three miles east of Portland, is one of hundreds dotting Casco Bay. Most are inhabited; others are just rocky outposts. This small island is so strategically set that during the Spanish-American War in the late 1800s, Fort McKinley was built on its eastern side as headquarters for the defense of Portland Harbor. Back then, a thousand soldiers lived here in stately, brick residences and Queen Annne-style officers' quarters surrounding an impressive parade ground. Today, the eastern third of the islandabout 200 acres surrounding the old forthas been converted into a residential community, Diamond Cove. 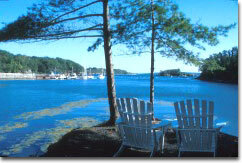 The red brick officers' quarters and barracks have been transformed into private homes and townhouses; the old wharf at the cove for which the community is named is now a marina, where sleek sailing and motor yachts lie waiting to explore Maine's fabulous coast.